Everyone loves an excuse to wear trackies for a day (I love my fold down top Bonds trackies & hoodies for around the house), so why not dack up for a great cause? TLC for kids is Australia’s emergency response charity for kids in hospital who need emotional support within 48 hours. There’s no such thing as a waiting list at TLC! Their annual ‘Tracky Dack Day’ campaign invites Australians to pick ‘one day in May’ to dack up and sport their prized trackies to raise awareness and funds for all kids in hospital. For these kids, trackies represent wellness and normality as they’re encouraged by nurses each morning to change out of their pyjamas to keep a healthy mindset. 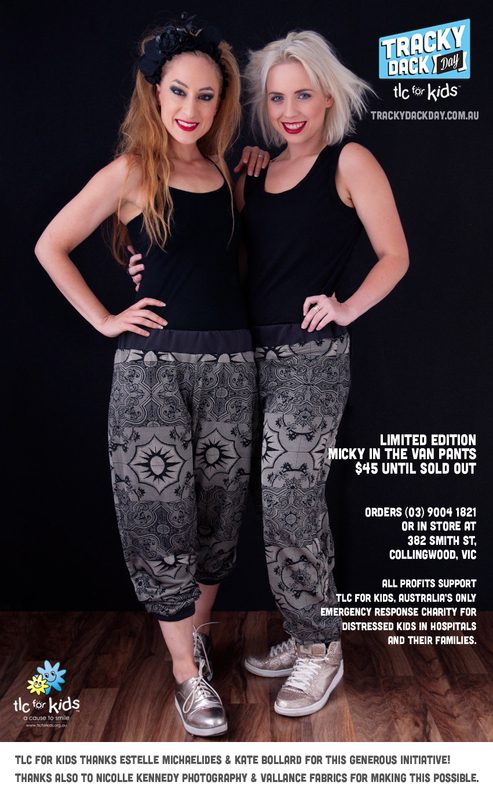 To purchase a pair of the limited edition ‘Micky in the Van’ pants, call (03) 90041821 or visit in store at 382 Smith Street, Collingwood, VIC. To raise money for TLC for kids, simply hold your own ‘Tracky Dack Day’ any day in May at your School, Workplace, Club or with your mates, collect a gold coin donation from everyone who participates and you’ll be helping TLC for kids reach even more children in urgent need. TLC for kids is the only national charity providing emergency emotional support for kids facing distressing situations in hospital. With a presence in over 400 hospitals across the country, TLC for kids’ services target the moments where a child’s fear and pain are at their peak. The national Distraction Box Program provides toys used as distraction aids for nurses to guide the child through a painful medical procedure, which benefits not only the child but also the healthcare system as a whole by drastically reducing treatment times. The Rapid TLC Program is TLC’s more personalised support service, providing emotional or practical assistance to protect the emotional wellbeing of the child or family unit, within 48 hours of the referral being made by the healthcare professional. TLC for kids’ services now impact a staggering 600,000+ kids each year. Previous Post Healthy smile, healthy body. Win a years supply of Colgate Toothbrushes!